Alexis Wineman is 18 years old, and will be competing in Saturday’s Miss America pageant, representing her home state of Montana. She’s not only the youngest contestant, but also the first ever autistic contestant. She is a beautiful young lady, and she has set out to do amazing things. She is already involved with several autism related organizations, speaks at various conventions, and her platform “ Normal is Just a Dryer Setting: Living with Autism” centers on building autism awareness and acceptance. Amen sister! I feel the same way, even being on the other side of the coin. I’ve always known my brother’s autism diagnosis was for a reason. 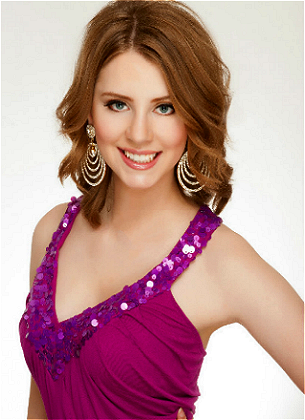 So, count me in as one of the millions of Miss Montana supporters. This girl is going to do great things, and already has. And, don’t forget to tune into the Miss America pageant Saturday January 12, at 9 PM EST. Last week an autistic boy was handcuffed after allegedly getting out of his seat harness and biting several people on the school bus. You can read the full story here. The school spokesperson says the bus driver and aide “followed protocol” by calling police when they weren’t able to calm the child down. I may catch some flack for what I’m about to say…but I’m going to say it…. Whether or not a person has autism has no bearing on the acceptability of aggression or violent behavior. None. Might there be an alternative to using handcuffs? I don’t know. Maybe… I have no idea. But the point of putting someone in handcuffs is to reduce the risk of the person hurting themselves or others. In this case, it was not a punitive response. It was a safety response. And to expect the community to “know how to handle autistic kids” is preposterous. I get that in this case, the bus driver and aide probably have had training in dealing with autism. But I’ve had lots of training, too. And sometimes children still get aggressive! So expecting people at large to know what to do in these cases is outrageous. As much as I’d love a world where people had tons of knowledge and experience and understanding of autism…they don’t; I can’t expect them to. And I certainly, can’t and won’t, expect the world to pardon violent or harmful behavior because a person is autistic. Yes, it’s important to spread awareness; I fully support that cause! But the reality is that the world does not revolve around autism. I’d be really curious to know what this mom suggests the people involved should have done instead. In my coursework training to become a Board Certified Behavior Analyst (BCBA) we were taught that if a person’s behavior endangers themselves or others and they are not able to be calmed or controlled, we should call the police. Now, whatever led up to the aggression in this case…maybe the staff could have done those things differently. Or maybe they did everything exactly right! Who knows! But regardless of the antecedent…if the response is aggression that threatens other people’s safety, stopping the behavior and protecting people is really all that matters in that moment. And, ultimately, this story reminds me why working on these behaviors while children are young (and small) is SO, SO, SO important. I am in NO way suggesting the mom in this article isn’t doing what she can to manage her son’s behaviors, or that parents of aggressive autistic children are at failing to do something. My own brother can become aggressive sometimes. And one of my biggest concerns has always been how people will handle these behaviors when he gets bigger. He will probably outgrow my mom in less than 5 years. So it’s imperitive to get it under control now. And I really encourage other parents to look ahead when dealing with aggressive behaviors. If it’s hard now, it will be exponentially harder down the road. Please don’t bury your head in the sand. I know it’s painful. I know it’s hard. I know it’s draining. I know it’s scary. And, I know it seems easier to just give in sometimes to make it stop. But not addressing it now will make your own life (and theirs) so much more difficult down the road. I implore you to hold the long-term picture in your head at all times. Sooner than we know, autistic kids will be autistic teens, and autistic adults. And the community around us will have even less tolerance for unsafe behavior. So the best thing people can do in the here and now, is never lose sight of the bigger picture. Our vision for the future can be our compass for the present. As I discussed in an earlier post, I was attacked for my use of my brothers name and picture when sharing about his diagnosis on my blog. Confidentiality is a hot topic for parents, and people on the spectrum. And by “hot topic” I mean scorching, blazing, on fire! As for me, it’s not that I don’t see the benefits of keeping things confidential; I do. And it’s not that I completely agree with everything Pro-Openness people think or do; I don’t. But, I obviously lean to the Pro-Openness side. So after the heat I took for it from people on Tumblr, I reached out to a woman who writes a weekly column (for a big newspaper) about her experiences with an autistic son. She has faced backlash for publishing his photo along with her articles a few times, so I knew she would have some words of wisdom on the topic. She wrote me back right away, and gave kind words of encouragement. One theme in her response was that she has come to accept that she will not please everyone, and she doesn’t strive to. It’s true. Anything that anyone says/writes/does is up for debate. But, just because that’s the case does not mean I need to change my story, or the delivery of my story, to fit other people’s molds. In the end, I think each person has the right to make their own decisions about confidentiality. So, if my stance doesn’t align with yours, I hope you’re able to refrain from judgment, ridicule, or condemnation. And, if your stance doesn’t align with mine, I promise to do the same. “Autistic person”…or “person with Autism”? Many people and parents have strong opinions on this topic. The idea is that calling someone “autistic” is looking at their diagnosis, instead of them as a person. Whereas, saying “person with autism” is looking at the person first, and diagnosis second. Many autistic people write about their dislike of person-first language. They assert that person-first language suggests you can separate them from the autism, which they believe you can’t. Autism is a part of them, and not a shameful or terrible part that needs to be separated. They are proud of who they are and don’t want their autism carrying a negative connotation. Other people with Autism are passionate about their preference for person-first language. They don’t want to be defined by, or reduced to, their diagnosis. They feel calling someone “autistic” is dehumanizing the person. People are more than their diagnosis. They prefer people to look at the person, not the disability. Personally, I vacillate between the two phrases. My own family isn’t particularly emphatic about one or the other, so I find that I interchange them. I have worked with families that use person first language, so when I’m around them, I do too. I have also worked with other families that don’t, so when I’m around them, I don’t either. But overall, my experience has been that people I’m around don’t really care either way. 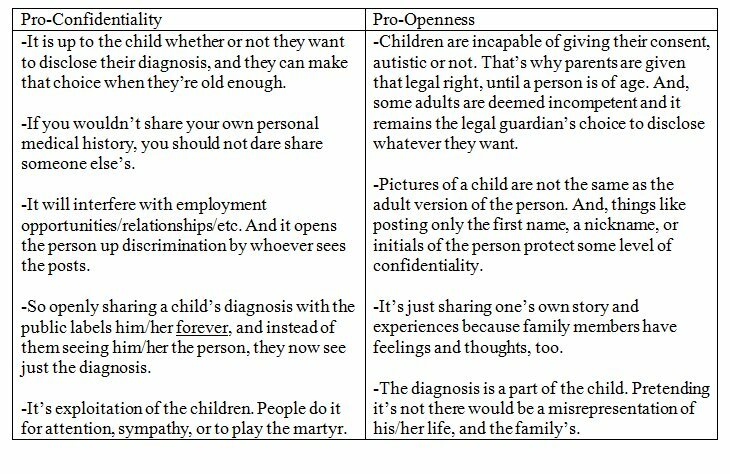 I feel that the separation of the person and the diagnosis perpetuates the stigma that it’s “bad” or “wrong”; Almost as though Autism is something so terrible or tragic that it needs to be estranged, rather than seen as part of the person. (Now, I am not necessarily saying “Autism is simply a beautiful, wonderful gift we should embrace!! !” But, I certainly don’t think it helps to overly vilify the diagnosis.) We use descriptors all the time in everyday life; “blonde girl”, “tall guy”, “fast driver”, “loud teacher”, “shy kid”, etc, etc, etc. And, in using those descriptors, we all realize those things do not define the person. They are just a way to quickly describe or categorize. No one would suggest that calling me a “brunette” is confining me, or reducing me, to a hair color. Everyone knows I am still a whole person, and pointing out my hair color is just looking at one part of me…not denying all my other qualities. So I think it’s the same with “autistic”. It’s used to describe something about a person, not to negate their wholeness as a human being. With that said, I understand people are going to have strong opinions on both sides of the fence. And, that’s okay. Because I don’t feel extremely zealous one way or the other, I can pretty easily adjust my language based on my audience at any given time. And interestingly enough, from my research online, it seems most autistic people actually prefer to be called “autistic” and rebuff person first language. I’d love to know where you stand on this issue.